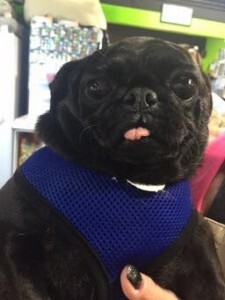 Betsy Blair – Adoptable through Pug Partners of Nebraska! Unlike my movie star namesake, I was born in Missouri which in fact is the location of the puppy mill in which I was rescued from. But from what I have researched like my name sake, I am tremendously loving, loyal, friendly, playful, fun, and I love to nibble on toes. 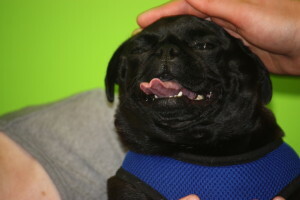 In less than a week of freedom I gained the friendship of three (3) pugs, in what is called a NORMAL household. They have taught me to navigate up and down the stairs and around the yard. I surprised my new mom when I walked through the doggy door one day. Now I go in/out to go potty on my own. And I enjoy playing and rolling around in the green fuzzy stuff outside they call “grass”. Well I’ll catch up with you later I’m going to go play.